Friday night, Ryan’s baseball team (The Rangers) played in the championship game. This was one to remember. They played a three-hour, seven-inning battle. In the 5th, they were up 10-4, but the Phillies came back and the Rangers held a slim 11-10 lead going into the 7th, and final, inning. The Rangers were visitors, and didn’t score a run in the top of the 7th, so they needed good pitching and defense to close it out. That’s exactly what they got. The first batter hit a soft liner in between 1st and 2nd, and Ryan was able to make the catch. One down. The second batter walked, and then stole second base easily. One out, tying run on second. He tried to steal third on the next pitch, and was gunned out by the catcher. Two down. The next batter battled to a 2-2 count, then popped the ball up shortly down the third base line. Our catcher came out, dove, and caught the ball – an amazing final play to a wonderful season. Ryan finished 1 for 2 with a walk and two runs scored, and the big catch in the final inning. Emily was in Chicago for the SHRM conference. 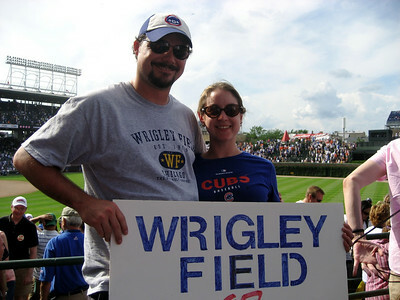 I followed up for a couple days at the end of the week, and we got to go to Wrigley Field and watch my beloved Cubbies play the Orioles. While the game was not so great (11-4 loss), we had a great time. Most of these pictures were from Mrs. Stasny, one of the team moms – I put this together for Coach B and to show at the team party. 2008 Pinto 8 Diamondbacks from Brian Dusablon on Vimeo. Ryan and the Diamondbacks wrapped up the regular season with an exciting 11-10 victory last night. They finished fourth (out of five teams) in the National League. Playoffs begin Saturday, a double-elimination tournament. Megan had her last dance class of the season today, and received a trophy. Their recital is Friday night, so keep an eye out here for photos/video.